Or are you actually referring to the meniscus line? Yes, kindly make it more clear according to the question about volume of colored liquids. What is the role of their color to note their volume? Do we have a language problem? Can you supply more detail about what you are trying to do? Everyone here is just guessing - not a good way to help. My first reaction, and I have not been in a chem lab for ages, is that the shape of the liquid is generally going to be as in figure A. It certainly is for water. The lower layer provides the most accurate measurement, since it is usually much wider than the upper narrow portion. Since water is transparent, you can observe the height of the lower layer from the side, which gives the optimal value. If a liquid is not transparent, you cannot see the lower layer, and you have to measure the height of the upper layer. I ready myself for being made fun of for a simpleton explanation of something that is probably infinitely more subtle. No, I think we don't have. I was just wondering about the point that does only color has any role in the volume or at least in noting a volume? I imagine multiple factors will change the shape of the meniscus (if that is what you are talking about) but I can't see how it would change the volume in any significant way (just make it more difficult to calculate, perhaps). Colour has only a minor peripheral role in noting volumes. There are many different graduated volume measuring vessels. They all serve different purposes and introduce their own special pros and cons. And each has its own way of using it. There is no meniscus in a syringe for instance. So I say again, explain what you want to do, or do you want to discuss measurement of volume in general, in relation to these or something else again. When you are talking about "the upper layer" do you mean the meniscus or do you mean there are (coloured) layers or what. This looks like you are asking about burettes and titrations. For a burette this means you never empty the burette. So when you draw off a desired volume of liquid the amount drawn is the difference in readings on the burette. 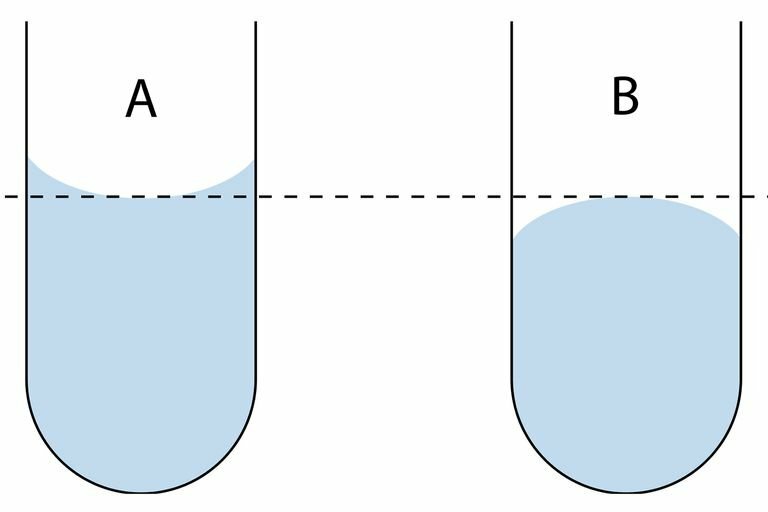 You should always measure from the same part of your meniscus and the most suitable part is the centre of the curve, away from the sides of the burette. You want the centre because it is difficult to visually estimate where the top of the liquid actually lies at the edges. This is partly because the triangle becomes thinner and thinner and you can't tell exactly where the top lies against the glass sides. And partly to avoid a phemenon known as parallax. Parallax is where you get the reading on the scale slight wrong because you are viewing at a slight angle (to the horizontal in this case). 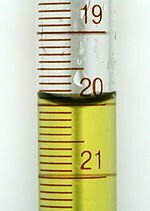 So if you open the burette tap until the bottom of the meniscus at the centre reads 21 in your picture, you will have drawn off exactly 1mL as there is still just the same amount of meniscus liquid above that line as before. Finally I commented that colour has a minor impact. Some liquids are hard to distinguish from the background because of their colour. Good practice would suggest holding up a card (usually white but a contrast colour) to improve the image. So can you think of a situation where we might want to do things differently and so minimise any other characteristic of the meniscus? Thank you for the upvote. How about trying my question at the end? It was not a trick but meant to lead to more help.